Salt Lake City Tribune and Kuwait Times write-ups! Coming home to a suprrise write-up that took up half of page 5 was pretty cool . The sub-header was my favourite part! 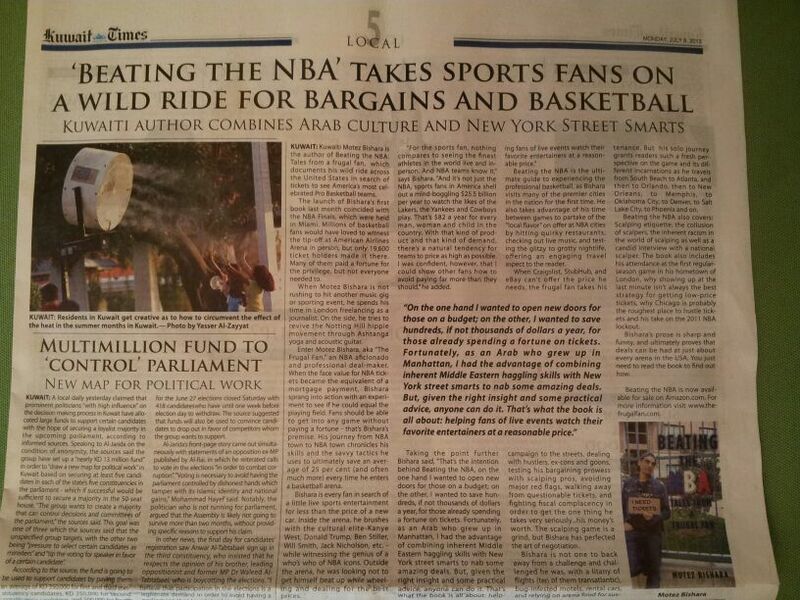 Not the most obvious two papers to link together, yet upon my arrival into Kuwait yesterday, both broadsheet newspapers had articles on “Beating the NBA: Tales From a Frugal Fan.” [One thing ‘Beating the NBA’ can lay claim to is having a disparate readership.] It was a very cool way to get a welcome home! The Jazz have some issues when it comes to playing consistent, team-oriented defense inside EnergySolutions Arena. But it’s apparently a different story outside the building. An author who toured the NBA in search of ticket bargains credits the brokers outside ESA with establishing an almost impenetrable defense. More accurately, Motez Bishara accuses them of collusion, not allowing one another to lower the prices. Beating the NBA: Tales From a Frugal Fan is Bishara’s story of how the secondary ticket market works. He shares his experiences of landing high-priced courtside seats for marquee games and finding huge discounts for other games, mostly by scouring websites and making in-person deals with scalpers outside the arenas. Except in rare cases, he succeeded in securing good tickets for much less than face value. So he was not happy about paying $20 for a $17 upper-bowl ticket to watch the Jazz play Phoenix on a cold night in February 2011. That’s a notable game in Jazz history. Jerry Sloan had resigned as coach the previous day, so Tyrone Corbin made his debut in a 95-83 loss to the Suns in front of a sellout crowd of 19,911 that included Bishara, who was surrounded by Junior Jazz players. Believing that he paid too much money for a seat near the top of the arena, Bishara writes an unfavorable account of his ESA experience. But that chapter aside, the book is intriguing. As he pointed out, many baseball fans try to visit every major league ballpark, but a tour of NBA venues is unusual. His stories focus mostly on what he had to do to acquire a ticket, but he also provides good flavor of the cities, arenas and teams. Thanks for checking in! PS, I am now finally on instagram under ‘motez56’. 56 was Lawrence Taylor’s # with the New York Giants, in case anyone was wondering. Aaaand, before I wax lyrical on the great LT, it’s over and out from me.